A Girl & A Garnish Turns 3! Who woulda thunk that I’d still be at this 3 years later?! 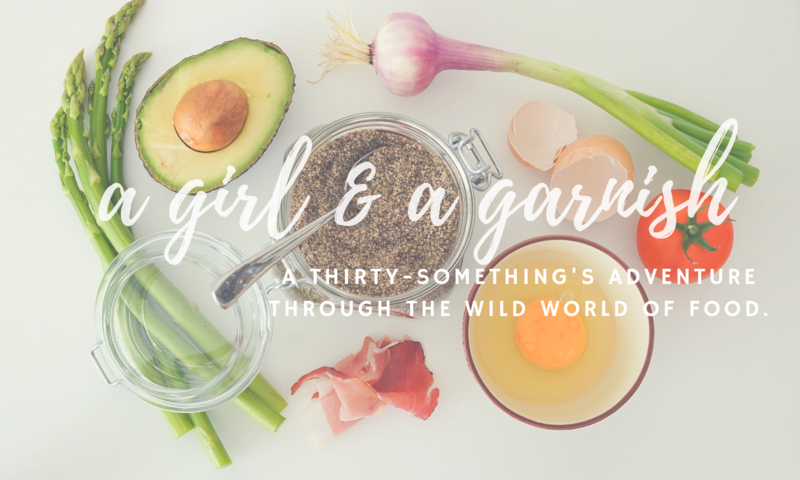 Here we are at the 3 year blog-iversary of A Girl & A Garnish and I couldn’t be more excited! I’ll be honest…2017 wasn’t my best blogging year. I spent the better part of the year in a writing funk & only felt compelled to do it for the ‘gram (aka post on Instagram). While my Instagram game will remain strong, I’m re-igniting my blogging passion & committing myself to posting at least once per week from here on out – you can all hold me accountable to that! I’m giving up meat…kinda. I’ve had a lot of challenges with my diet lately and felt the need to make some changes. I’m going to attempt to be a weekday pescatarian [meaning no meat, just seafood] – giving myself a little leeway on the weekends to indulge in a burger or pepperoni pizza here & there. I’ve been going one week strong & feel good about it so far! I’m cooking at home more. My original intention behind starting A Girl & A Garnish was to share recipes, BUT I’ve been terrible at cooking at home for quite a while now. My waistline & bank account have really felt the effects of that, so I’m making a change. Plus it will give me more content to share with all of you. My new goal for 2018 is to only eat out once per week – that includes take out and dining out. I’ve also only been at this for a week & didn’t quite hit my mark [I ate out twice] but I’m doing better! Baby steps, people. I’m launching a newsletter! I know, I know – you probably don’t want more things in your inbox. But I hope you’ll at least give it a try. In the newsletter I’ll be sharing my recipe of the week, re-sharing older posts that are relevant to the new recipe, plus any other exciting things going on in the cooking/foodie scene. It’ll be a great way for us to connect and to really grow the G&G community. I’d love to have you along for the ride, so follow this link to join the party! Well, you’ve been with me for 3 years now & I’m hoping that you’ll stick around for many more – I couldn’t do it without you! Don't miss out on new content - be sure to follow & receive updates right in your inbox!